Click the Calendar command on the Options menu. Right-click the task tray icon and select the Calendar command from the Options submenu. Click the Calendar tab in the Options window after it has been displayed by using one of the other commands in the Options menu. The Calendar tab of the Options Window enables you to specify general calendar settings. When this option is enabled, event tooltips will be displayed in the Calendar View and Desktop Calendar. If the "Show event descriptions in tooltips" box is checked, the tooltips will include event descriptions, including special formatting like embedded pictures. Uncheck this option if you don't want to see larger tooltips or additional details. The tooltip size can be adjusted. If the text of the tooltip is too small, try increasing the tooltip size to "Large" or "Huge". The following is an example of a tooltip when the option to show descriptions in tooltips is enabled and the tooltip size is set to Medium. 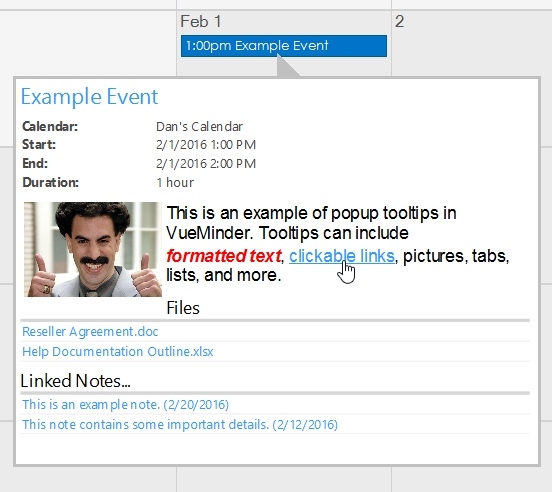 When deleting an item, such as an event or calendar, VueMinder will prompt to confirm the deletion, by default. For example, when deleting an event, the following message will be displayed. This prompt can be disabled by unchecking the "Prompt to confirm item deletion" box. If you check the "Don't ask me again" box in the confirmation dialog, and later change your mind and want to see this dialog before deleting items, it can be re-enabled via the checkbox in the Calendar Options window. 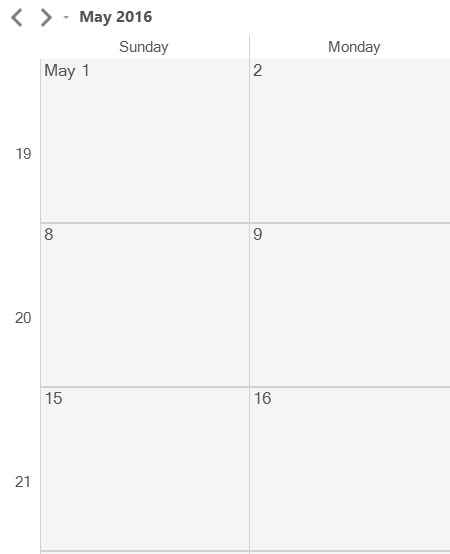 Each calendar can have its own default settings for new events. These defaults can include reminders, categories, priorities, and more. When reassigning an event, the message enables the defaults to be assigned to the event, overwriting previous values. 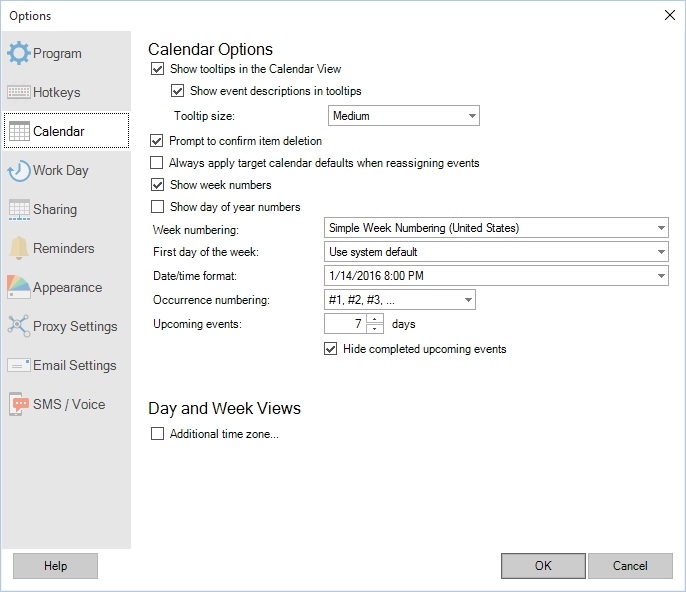 To disable the message and always apply the target calendar's default settings, check the box on the window and then click Yes. This option also be modified in the Calendar Options window, using the checkbox labeled "Always apply target calendar defaults when reassigning events". When enabled, this option will result in week numbers (1-53) being displayed in the week header area of the Month View, Year View, Date Navigation Pane, and Desktop Calendar. Week numbers in the Month View will only be visible if the "Show Week Header" option in the Month View Settings menu is enabled. Two standards for week numbering are supported, Simple Week Numbering and ISO 8601. Simple week numbering will cause the week containing the first day of the year to always be numbered as 1. This is the standard used in the United States. ISO 8601 week numbering will cause the week containing the first Thursday of the year to be numbered as 1. This is the standard used in Europe. When this option is enabled, the day of the year number will be displayed in the Details Pane when a date is selected. The day number will also be shown in the notification icon's tooltip. The first day of the week will default to match your regional settings defined in Windows. For example, in the USA, the first day of the week is Sunday, while in the UK, it's Monday. If you prefer a different first day of the week, you can select it from the drop-down list. This will affect the left-most day that is displayed in the Navigation Pane, Week View, Month View, Year View, and Desktop Calendar. It will also affect the Monthly and Yearly print styles. By default, the date and time format that is shown the Popup Reminder Window and List View will use a short format, based on your Windows regional settings. If you prefer a longer date/time be displayed, or if you prefer a format (and language) that matches what is used in the United States, you can select a different option from the drop-down list. Example formats based on the current date and time will be displayed for you to select from. Note this option is not used in text message reminders. When occurrence numbering is enabled for a recurring event, in the Recurrence tab of the Event Editor, the occurrence numbers will be shown as (#1, #2, #3, ...) or (1st, 2nd, 3rd, ...), depending on which numbering format is selected. 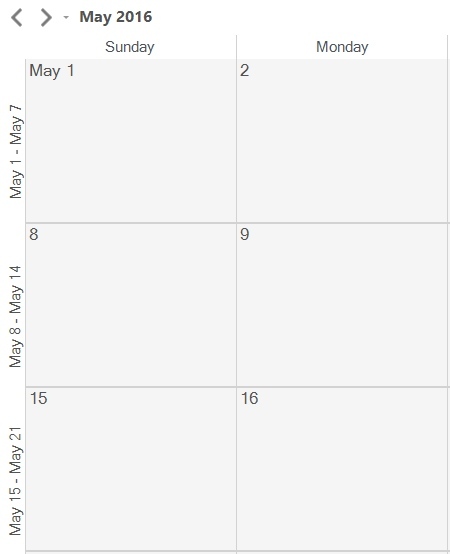 The number of days used for listing Upcoming Events on the Desktop Calendar can be adjusted. A checkbox enables completed events to be shown or hidden from the Upcoming Events list on the Desktop Calendar. When syncing calendars, an internet time server is used to ensure the timestamps are correct in relation to your computer's locally configured time. This ensures changes are properly detected and synced. The default time server is "time-nw.nist.gov". If necessary, a different time server can be typed in or selected from the drop-down list. A list of time servers provided by the U.S. National Institute of Standards and Technology (NIST) can be found here. This option enables times for an additional time zone to be displayed side-by-side with times for the local time zone in the Day View. A label for the additional time zone can be entered, if desired. This label is displayed above the additional time zone column.